The ARIES Pro Series represents a higher class of truck accessories and is reserved for those who see their ride as more than just four wheels and a cab. Deviating from the mundane, ARIES Pro Series 3" round side bars are distinguished in design and construction. 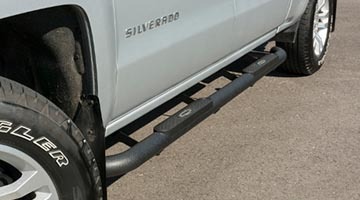 Each made to be vehicle-specific, Pro Series side bars complement the unique layout of your vehicle and install with ease. We offer them in two finish options, including our Pro Series textured black finish and polished stainless steel finish, and both are backed by warranty for peace of mind on the road ahead. Pro Series 3" side bars begin with a heavy-wall 3" diameter tube design to give them strength and stability. 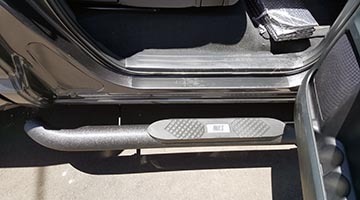 Each side bar is made for a specific make and model of truck or SUV to provide optimal functionality and to contour perfectly with your vehicle's unique shape. 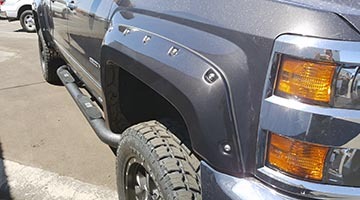 The custom bends of the Pro Series side bar integrate with your vehicle's body, while the custom brackets are tailored to perfectly fit the vehicle's frame. The brackets provide superior strength and use pre-existing factory holes to speed up installation by eliminating the need for drilling. The textured black Pro Series side bar is both rugged and sleek, featuring a high-strength carbon steel build and a thick powder coat skin. The powder coat offers a bold textured finish that resists the elements and easily hides scratches and grime. To ensure excellent resilience to the wear and tear of the road no matter what season you are driving in, we also put our black powder coat side bars through an extensive salt spray test. For our stainless steel Pro Series side bars, we use a 304 stainless that contains high amounts of nickel to truly resist rust and corrosion. We also give them a triple-polished finish for a brilliant luster and a striking accent for your vehicle. 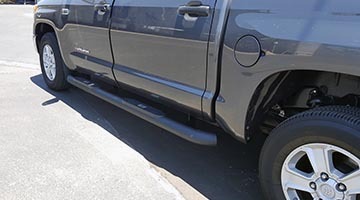 If you expect sure footing every time you climb into your truck, ARIES 3" round side bars have you covered. Our side bars are proven to fit and warrantied against defects to give you confidence for whatever lies ahead. We back our Pro Series 3" side bars with a three-year warranty for the textured black finish.